The case of Asia Bibi has resonated across the world. The basic facts are straightforward. 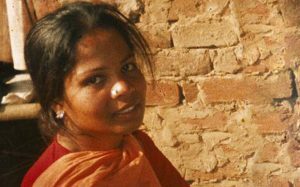 Aasiya Noreen commonly known as “Asia Bibi” is a Pakistani-Christian, who was accused of blasphemy back in 2009 after an argument with muslim co-workers while harvesting berries. She was subsequently arrested and imprisoned. That’s how tolerance works in Pakistan. In November 2010, a Sheikhupura judge sentenced her to death by hanging. The verdict was upheld by Lahore High Court and received worldwide attention. 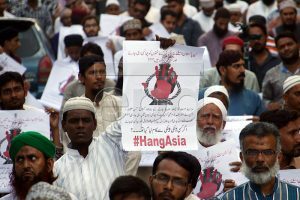 On 31 October 2018, the Supreme Court of Pakistan acquitted Asia citing “material contradictions and inconsistent statements of the witnesses” which “cast a shadow of doubt on the prosecution’s version of facts.” The decision sparked protests headed by Islamist parties in major cities of the country. The scale of mob violence towards this Christian woman was savage. On 2 November 2018 however, the Government of Pakistan signed an agreement with the Tehreek-e-Labbaik political party (TLP), which was leading the protests; this agreement barred Asia Bibi from leaving the country. On 7 November 2018, Asia Bibi was released from the New Jail for Women in Multan. The Ministry of Foreign Affairs has denied that she had left the country and said that she remains in Pakistan. It seems that her only chance of survival lies with an offer of sanctuary by a foreign country. If she is denied this the chances are the Islamists mobs baying for her blood in Pakistan will kill her. So this is literally a case of life and death. Which brings us to the UK. It is being reported in BREAKING NEWS that the UK has chosen to deny her sanctuary. Wilson Chowdhry, chairman of the British Pakistani Christian Association, said two countries had made firm offers of asylum, but Britain was not one of them. In essence the UK Government seems to be saying that it is frightened that the relatives of the Islamist fanatics that want to hang her in Pakistan would become violent in the UK should she be offered sanctuary here. So despite the fact that hundreds of thousands of Pakistani Muslims are welcomed in the UK, one Pakistani Christian is denied access. This is how cowered and morally bankrupt the UK Government has become. It fears the single largest immigrant community it has imported. It is a hostage to radical Islam. It would rather see this Pakistani Muslim face the baying mob that want her hanged than do the decent thing and give her sanctuary. It is a disgrace.